Literary works 2012 – what’s being reviewed? What contribution has the AWW challenge made to the reviewing books of literary merit published recently by women writers in Australia? Publishers: Random House: 2 books, 7 reviews; HarperCollins: 1 book, 6 reviews; Pan Macmillan: 1 book, 3 reviews; Allen & Unwin: 1 book, 2 reviews; Text: 1 book, 1 review; UQP: 1 book, 1 review; Spinifex Press: 1 book, 1 review. The above books were defined as “literary”, either by their reviewers or the publishers. How do you define the term “literary”? 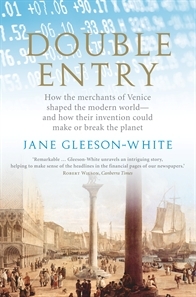 Should nonfiction books of literary merit be included, such as Jane Gleeson-White‘s creative nonfiction history, Double Entry: How the merchants of Venice created modern finance? Published by Allen & Unwin; reviewed for AWW by historian Yvonne Perkins. Or True North, by Brenda Niall (Text 2012), the story of Mary and Elizabeth Durack, also reviewed by Yvonne Perkins? Are there other – broadened defined – “literary” books by Australian women published in 2012 that aren’t on the above list?